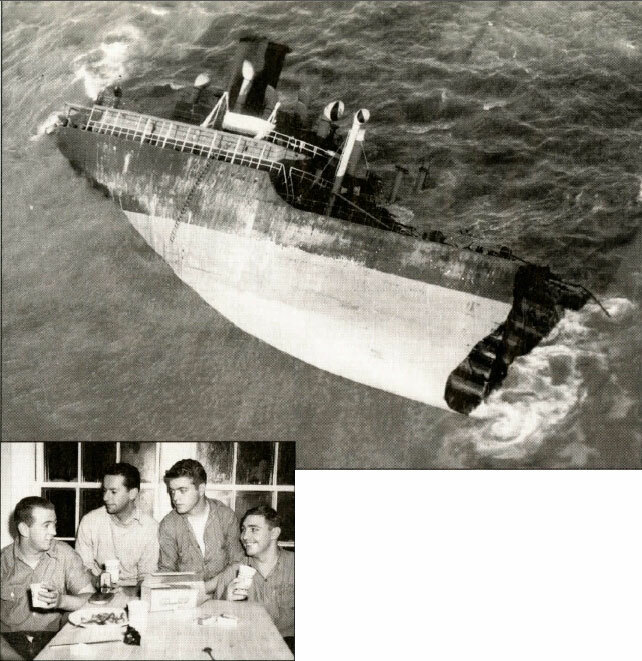 It has been 50 years since First Class Boatswain’s Mate (BM1) Bernard Webber and his volunteer crew of three took their 36-foot wooden motorized lifeboat out over the Chatham, Massachusetts, bar in 60-foot seas and 70-knot winds and rescued 32 men from the stricken tank vessel Pendelton. 1 Despite the passage of time, memories-especially the death of a 33rd crewman during the rescue-still are vivid for the 73-year-old small-boat coxswain. 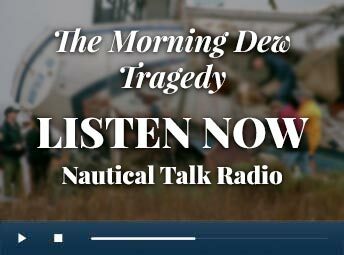 This is a story of unparalleled heroism by a Coast Guard smallboat crew. The 503-foot, lO,448-gross-ton tank vessel Pendelton (T2-SE-Al or “T2”) departed Baton Rouge on 12 February 1952 with a full cargo of Kerosene and heating oil and a crew of 41, including the master, Captain John Fitzgerald. Late on 17 February, the ship arrived off Boston. The weather was foul with extremely limited visibility, and the captain opted to stand off and headed his vessel at slow speed into Massachusetts Bay. Wind and sea conditions worsened throughout the night, building into a full-scale nor’easter with snow and high seas. By 0400 on 18 February, the Pendelton was shipping seas over her stern but appeared to be riding well. Sometime after, she rounded the tip of Cape Cod off Provincetown and assumed a more southerly course. At about 0550, after a series of explosive cracking noises, the Pendelton took a heavy lurch and broke in two. Gone with the darkened bow section were the captain and seven crewmen, all destined to perish. In the stern, which continued to operate normally, including all machinery and lighting, Chief Engineer Raymond Sybert took charge and mustered his 32 survivors. On 18 February 1952, the Coast Guard would rescue 70 men from the seas. Like the Pendelton, the T2 tank vessel Fort Mercer also had split in half off Cape Cod, about 20 miles offshore. Bos’n Cluff’s initial reaction was to dispatch his remaining crew, including BMI Webber, to North Beach in hopes they could render assistance to the Pendelton‘s crew if either section of the vessel came ashore. It soon became apparent that neither section would come ashore there, however, and the crew returned to the station to prepare the CG36500 MLB to render aid. Bos’n Cluff ordered Webber to “pick yourself a crew. Y’all got to take the 36500 out over the bar and assist that ship, ya-heah?” With great trepidation, knowing his likely fate but understanding his duty, he replied, “Yes, sir. I’ll get ready.” 5 Only three men were available, as “other crew members had made themselves scarce when they heard CG36500 was to be sent,” but all quickly volunteered. 6 Webber was joined by the station’s junior engineer, Engineman Andrew Fitzgerald, Seaman Richard Livesey, and Seaman Irving Maske, a crewman from the nearby Stonehorse Light Ship who had been waiting for transportation back. At about 1730, as BMI Webber and his crew readied their dory to row out to the CG36500, local fisherman and neighbor John Stello yelled out, “You guys better get lost before you get too far out.” 7 Webber knew what his friend was suggesting: go out and probably die or get “lost” and live to talk about it. The day after the dramatic rescue, the broken stern of the Pendelton shows the Jacob’s ladder still hanging over the side of the ship. At left, the rescue crew-Boatswain’s Mate Bernard Webber, Engineman Andrew Fitzgerald, Seaman ichard Livesey, and Seaman Irving Maske-relaxes at the station after their wild night at sea. As they approached Chatham’s bar, the small-boat crew began to sing “Rock of Ages” and “Harbor Lights,” but their voices were drowned out by the roar of the ocean colliding with the sand bar. 9 Crossing over, the CG36500 was smashed by a wave and thrown high in the air, landing on her side. The self-righting boat recovered quickly and was smote again; this time tons of seawater crashed over the boat, breaking its windshield and flattening Webber. Scrambling to his feet, Webber noticed the boat’s compass had been knocked off its mount. The cold, near-hurricane-force winds howled through the cockpit as he struggled to regain control and steer into the towering waves. On the Pendelton, the engineer and his crew sensed their demise as the stem hulk hobby-horsed southward, smashing bottom with each new wave. 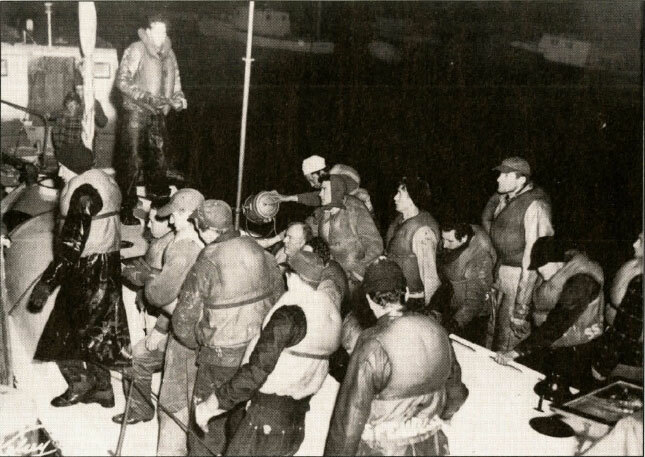 Although several Coast Guard cutters and the CG36383 were nearby, only the CG36500 and her crew would be given one attempt to save Sybert and his men. Occasionally, when the waves rolled the vessel over, the gasoline engine would lose its prime and die out. Each time, Engineer Fitzgerald crawled into the cramped compartment to restart it, and each time he was rewarded with severe burns, bruises, but finally the steady chug-chug of the engine and the relief and appreciation of his shipmates. The boat proceeded roller-coaster fashion, laboring up one side of a huge wave and surfing down the back side. Coxswain Webber knew too much speed was not good and, unchecked, would cause the bow to bury in the next wave and swamp the small vessel. 12 He had to reverse the engine on the back side of each wave to slow the boat down. The first navigational waypoint was the Pollock Rip Light Ship, where Webber hoped to reorient himself and give his crew a breather in the lee of the larger vessel. Weather and visibility had worsened, and freezing horizontal snow lashed the coxswain’s face through the broken windshield. He wore no lifejacket to give himself the best chance to react and guide the vessel. After about an hour of struggling, fearing he had missed the lightship, Webber slowed the CG36500 to a near standstill as he sensed, rather than saw, something ahead. He sent a crewman forward to energize the boat’s small searchlight. Within seconds, the light was on, but a large wave lifted the crewman up and over the coxswain flat and carried him aft, where he landed with a thud, but miraculously unhurt. Webber crept the boat forward, and the searchlight soon revealed a black mass of twisted metal, which heaved high in the air on the massive waves then settled back in a “frothing mass of foam.” 13 Each move produced a cacophony of groans as the broken ship strained in the 60-foot seas. No lights were apparent as Webber maneuvered the small boat aft along the port side of the Pendelton‘s stern section . Rescue boat CG36S00 returned to Chatham Fish pier with 32 dazed survivors from the Pendelton. Rounding the stern, the CG36500’s searchlight illuminated the word PENDELTON, and moments later, the larger vessel’s own deck lights became apparent. A small figure above began waving his arms frantically, then disappeared. Quickly, people began to line the Pendelton‘s starboard stern area, many shouting instructions, which were unintelligible over the wind and crashing seas. Webber looked on their position as “inviting” relative to his own and was considering strategies for how he and his crew could join them when a Jacob’s ladder was tossed over the side and, unbelievably, men started down like a procession of ants. 14 The first man was dunked in the water like a tea bag then lifted 50 feet in the air as the Pendelton rolled and heaved. Webber sent his crew forward to assist as he maneuvered the CG36500 along the Pendelton‘s starboard quarter. One by one, the tanker’s survivors jumped, crashing on the tiny boat’s bow or falling into the sea, where Webber’s crew assisted them on board at great personal risk. Some Pendelton crewmen were sling-shotted out from the ship on the Jacob’s ladder by the whipping of the waves. As they reached their zenith of flight, the ship would snap them back and slam them against the hulk. And so it went as Webber and his crew literally stuffed their rescuees into the boat and risked life and limb again and again. Finally, with 32 survivors recovered, there remained at the bottom of the ladder only George “Tiny” Myers, a 300-pound giant of a man and the inspiration of the Pendelton crew for his personal heroics. Myers had distinguished himself by helping his 32 shipmates before considering his own situation . Myers jumped too soon and was swallowed up by the sea. Moments later, he was visible underneath the stern, clinging to one of the Pendelton‘s II-foot propeller blades. Easing ahead cautiously, Webber felt the stern of his small boat rise as a monstrous wave overtook her. The CG36500 was driven ahead faster and faster toward Myers. Webber backed his engine hard, but the boat smashed into the Pendelton and Tiny Myers. The CG36500 was ejected from underneath the Pendelton by another large wave just as the hulk was lifted one last time and rolled over. With no compass and zero visibility, Webber had just two choices: head east into the seas and hope to survive 10-12 hours until daylight brought the slim chance of transferring passengers to a larger rescue ship; or put the wind and seas on the small boat’s stern and let them force the vessel ashore someplace where help might be nearby. Webber turned off the radio and devised his own plan to beach the CG36500 at the first opportunity. 18 The small vessel would be held on the beach as long as possible with the engine while the survivors clambered ashore. The Pendelton crew gave a cheer of approval and support and on they went. Very soon, a flashing red light appeared, and incredibly, the boat’s searchlight revealed the buoy marking the turn to Old Harbor, Chatham, and safe water. A quick call to the station was met with excitement, for everyone knew that the rescued were now survivors. After another stream of overdirection and gibberish, Webber once again secured the radio after requesting assistance at the Fish pier.